Arthur was a man of principle, a scholar, an officer, a gentleman, a gentle man and a man of the community; these were among the plaudits spoken at his funeral, in an overflowing All Saints Church Ōtaki on September 21. Arthur was best known for his lifetime in education. He was educated at Ōtaki Primary School before going to Palmerston North Technical School, where his parents were told he could be a teacher or a policeman. So he went back to Levin District High School before he went to Wellington Teacher Training College and spent his probationary assistant term at Ōtaki School, before the war years intervened. After his time in the New Zealand Airforce he spent 10 years working on the family dairy farm milking cows before he returned to teaching. He began at the Ōtaki Children’s Health Camp School in the 1950’s, then founding headmaster at Waitohu School in 1963. He moved back to Ōtaki School as headmaster until he retired after 40 years teaching. 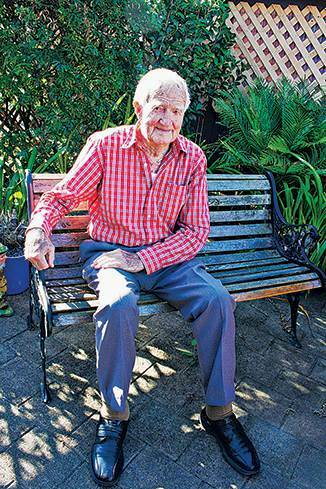 Arthur led a full and active life, even at 98 he was still setting goals for himself, including celebrating his 100th birthday in 2017 and preferably make it 102 years. But this was not to be as a brief illness cut short his aspirations, which included another trip to his sons in Australia, a trip he had already made 40 times. It included four camping trips with family members to the outback – his task each trip was to set up the camp stretchers and mattresses. He was one of four children, Hilda, Fred, Isobel and Arthur. He started life in Wellington until moving to Ōtaki with his family at age three in 1920. His father had emigrated from Germany as a teenager. Once in Ōtaki, father bought 25 acres of land between the racecourse and the railway, which became a dairy farm, they had chooks and sold the eggs as well as cut flowers. Father believed in self-sufficiency and grew all their own fruit and vegetables. The children attended Sunday school at the small Anglican Church next to the dairy factory. Once he was at secondary school, Arthur still had to milk the cows before catching the 7.30am train to Palmerston North. Maybe during these few years Arthur was not quite the “perfect” boy most assumed he had been. Later there were tales of the exploits on the morning journeys — the 7.30 was a freight train with two passenger cars at the back end – one for the girls and one for the boys, the seats were sideways along the carriage and a good game was for all the boys to hold onto the handrail on one side swinging their bodies from side-to-side making the carriage sway perilously. The return journey in a passenger train was much more sedate. When World War II began, Arthur joined the New Zealand Air Force in 1940 and gained his pilot’s licence at Taieri airport. He was first sent to teach young airmen to fly tiger moths, then was transferred to Whenuapai where he learned to fly the Walrus flying boats, before he joined the Catalina flying boat squadron and was based in Fiji. By the end of the war, Arthur had been promoted to Flight Lieutenant. While based in Fiji he serviced the bases in the Solomon Islands, and Noumea among others. It was in Fiji his met the love of his life, Betty. They were engaged within three weeks and married three weeks later. They had a house in Suva. There were high jinks again with a story of the need to take a Catalina out to sea on a bombing planning mission. But the flight was to actually meet a certain ship with a certain young lady on board, who was to be the recipient of a bunch of flowers dropped from the Catalina. They missed the deck but a sailor was detailed to retrieve them from the sea. They were married for 52 years before her death in 1998. But was only in 2013, when Arthur went to Noumea on a NZ Veterans Affairs air force trip, that he was able to see his brother Fred’s wartime grave for the first time. After the war he returned to the family farm, which he bought, but after 10 years milking he went back to teaching. In 1975/76 he set it up as a market garden and his sons, Dennis and David spent their weekends doing the chores — mending fences, pruning trees. He waged war on oxalis — a gardener’s parasite — he paid the boys one shilling (10 cents) for every oxalis clove they brought. They admitted there were times the same cloves were produced! Later the boys and their sister Jocelyn bought the farm and split it into three sections. When he retired after 40 years teaching, the staff at Ōtaki School gave him a fishing rod as a farewell gift. With his government pension and teaching superannuation, he bought a holiday cottage in Turangi with half of his teaching super. There were many wonderful times spent there and some great fishing. The family took him back to the Turangi for his 98th birthday in February, but the fish weren’t biting that trip. Rex Kerr spoke on behalf of the Ōtaki Rotary Club where Arthur had been a charter member from 1966–77. “Arthur was not old. He was alive and active until the end. He was one of a kind, one out of the box.” He attended all the important meetings and was there to cut the 50th jubilee cake two years ago. Son Dennis told of Arthur’s passion for books. “During the setting up of Waitohu School, Dad was given money from the Department of Education to set up the library. Among the books he purchased was one Australian book of poems and other items. This book never made to the library shelves – some of the language was inappropriate” he said. He read out one particularly “juicy” poem and then called the current Waitohu principal, Maine Curtis, up to present the book to him. After 52 years the book is where it belongs at the school. Mr Curtis after receiving the gift spoke of Arthur and the impression he made on people and the inspiration he was to them. Just three weeks before he died, Arthur travelled on the special Passchendaele steam train, from Paekakariki to Ōtaki, commemorating 100 years since the World War I Battle of Chanuk Bair, a journey and day he greatly enjoyed. Talking to Dennis and his wife Gaye, the day after the funeral, more tales were told, of card games with the family “he couldn’t play Cheat, he couldn’t lie so he couldn’t cheat!” daughter-in-law Gaye laughed. And whenever she made a pie he insisted he would cut it, the one who cut always got the smallest piece. After Betty died he taught himself to cook – he had rarely needed to cook anything. He followed the recipes and became a very proficient cook. His cake tins were always full of home baking and he cooked wonderful meals. He loved his garden and still cared for it himself – his orchids were used to scatter on his coffin and he was still driving his car. He was a greatly loved father, grandfather of six granddaughters and two great-grandsons. But he missed the two soon to be expected ones. A queit, gentle man, who will be missed by family, friends and in the Ōtaki community.